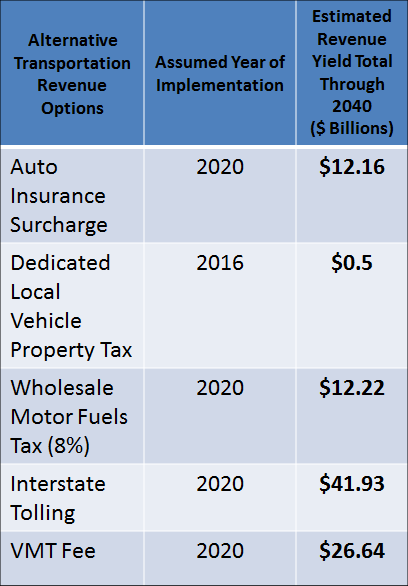 Due to increasing fuel efficiency and the expected decrease in the revenue projected for the state motor fuels tax that will result, the NC Department of Transportation has outlined a number of alternative (new) revenue options to help our state meet its transportation needs. Fees would be dedicated to the transportation system – to maintaining state of good repair and providing additional transportation capacity. These fees would also not be – or would be less – sensitive to the effects of improving fuel efficiency. Auto Insurance Surcharge: Revenues are based on a 10% surcharge levied on the liability portion of the premium paid for auto insurance. Local Vehicle Property Tax: This option assumes that a 5% increase in existing local property tax collections on motor vehicles would be dedicated for local road projects. Wholesale Motor Fuel Tax: This is envisioned to be a new tax that assumes an 8% tax rate on the wholesale price of motor fuels. Interstate Highway Tolling: This option is based on tolling all of the North Carolina’s Interstate highways beginning in 2020. Tolls are set at a rate (in 2011 dollars) of $0.12 cents per mile along the more heavily traveled urban sections and $0.06 per mile in rural sections. Vehicle Miles Traveled (VMT) Fee: Given the anticipated decline state motor fuel tax revenues as a result of increasing fuel efficiency, a statewide VMT fee could be considered as a replacement revenue source. While it is recognized that there are significant technology and privacy issues that would need to be resolved prior to the implementation of the fee, it is understood that a VMT based tax is a more sustainable and equitable funding source than the motor fuels tax because it directly links the fee paid with the users and usage of the highway network.